Italian chef and experienced restaurateur Roberto Bearzi and wife Fiorella Blanco, the heart, hands and soul behind Downtown Miami’s Italian restaurant Fratelli Milano, are proud to announce the opening of vista, a two-story restaurant that is adding a flavorful twist to Italian cuisine within Miami’s newest burgeoning area and micro-boutique destination, Upper Buena Vista. The restaurant’s interior and outdoor patio are set to open in August. vista’s rooftop lounge will open Fall 2018. Twelve years after the inception of Fratelli Milano, Bearzi and Blanco have decided to expand their horizons. After coming across the charming, emerging complex of Buena Vista, which is nestled between the Design District and Little Haiti, they knew the tranquil oasis would be the perfect location for their next culinary endeavor. 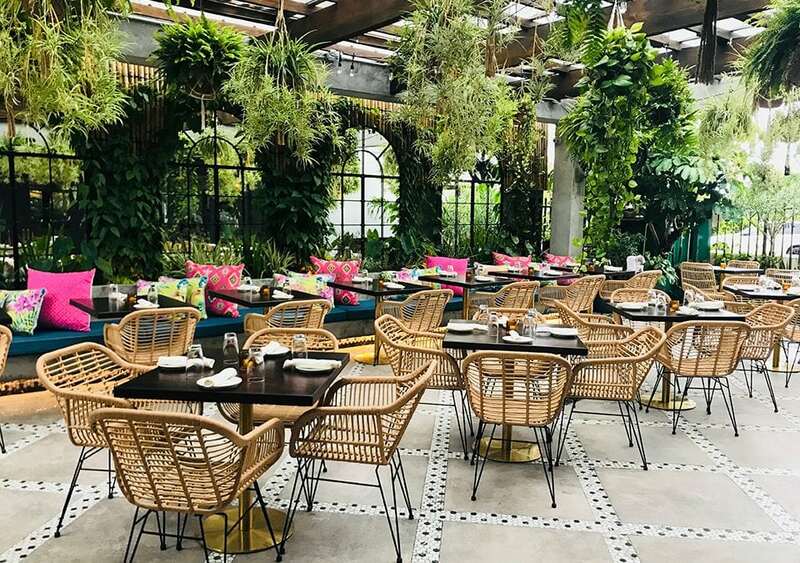 Located on NE 2 nd Ave and 50 th Street and nestled near a 150-year-old Banyan tree, vista is the full-service restaurant in the Upper Buena Vista complex that will offer flavorful cuisine influenced by Miami’s local tastes and multicultural backgrounds. The chef-driven cuisine is built around a strong focus on fresh ingredients. “We will be working closely with local purveyors to source seasonal ingredients and fresh fish for our crudos and seafood dishes to truly showcase Miami’s eclectic palate,” explains Blanco, co-founder of vista. The restaurant will offer patrons a wide-ranging, all-day menu, with dishes moderately priced between $9-38. Standout appetizers include Calamari Fritti with sesame salt, pickles and yuzu sabayon, and Fisherman Crudo (market fish) with mango salad, citrus and cilantro oil. A selection of entrées includes Maltagliati Brisket with homemade maltagliati pasta, slow braised brisket, tomato and parmesan cheese, Poblano Pesto Gnocchi with poblano peppers, mint and pistachio and Snapper a la Plancha. The name vista, which means “view” in Spanish and Italian, is symbolic of the restaurant’s mission to introduce patrons to a new perspective on their more traditional Italian cuisine. The restaurant’s chef-centric cuisine is crafted by owner-chef Roberto Bearzi and Chilean-Italian chef Giuliano Leverone, a former Fratelli Milano waiter whose years working at the family-owned restaurant inspired him to pursue a career as a chef. Upon graduating from Le Cordon Bleu, Leverone worked in various Miami restaurants, including Cecconi’s, Barceloneta and Matador Room, as well as New York City’s Mandarin Oriental. Vista’s design blends both of the owners’ backgrounds seamlessly. The building’s industrial façade is reminiscent of Bearzi’s hometown of Milan, Italy, while the exterior’s laid-back décor adorned with tropical plants and bamboo finishes resemble Blanco’s homeland of Costa Rica. With more than 4,000 square feet of space, comprised of an indoor dining room, outdoor patio and rooftop terrace, vista can accommodate up to 160 guests with a variety of ambiances. This, coupled with the restaurant’s neighboring location to Miami’s growing dining hubs of the Miami Design District, Little Haiti, Wynwood and Midtown, positions the restaurant at the center of the city’s travel-worthy restaurant scene. Located in Miami’s Upper Buena Vista area on 5020 NE 2 nd Avenue, vista is a local culinary destination by Italian chef and restaurateur Roberto Bearzi and wife Fiorella Blanco, the heart, hands and soul behind Downtown Miami’s Italian restaurant, Fratelli Milano. The restaurant brings a flavorful twist to Italian cuisine. Vista will be open daily, including Monday through Thursday from 11 a.m. to 11 p.m., Friday from 11 a.m. to midnight, Saturday from 10 a.m. to midnight, and Sunday from 10 a.m. to 10 p.m. Happy hour is available weekdays between 3 and 7 p.m., and brunch is available on weekends from 10 a.m. to 4 p.m. For more information, visit https://www.vistamiamirestaurant.com/. Situated just north of Miami’s Design District and Buena Vista neighborhoods, Upper Buena Vista is a community-driven lifestyle destination that embraces Miami’s progressive evolution. A tranquil enclave where specialty retail, hospitality and wellness coalesce, Upper Buena Vista reactivates one of Miami’s most charming neighborhoods, offering a synergistic mix of concepts by established brands, local craftsmen and aspiring entrepreneurs. Stemmed from a passion to support businesses it believes in, Upper Buena Vista embraces Miami’s culture, and injects it with global flare. It honors the locale, while welcoming international concepts, to create an experiential atmosphere where newcomers and longstanding businesses can both thrive.